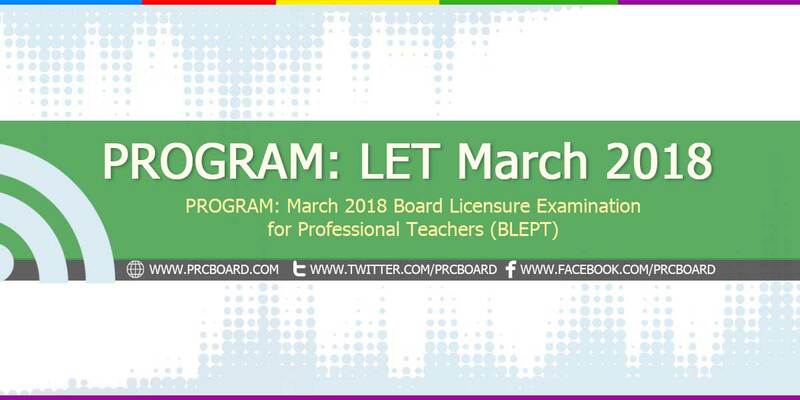 MANILA, Philippines - The Professional Regulation Commission (PRC) released the complete program of the March 2018 Licensure Exam for Teachers (LET) elementary and secondary levels few months before the scheduled exam. The first schedule of LET for the year 2018 will be held on March 25, 2018 (Sunday) at various testing centers around the country particularly in Manila, Zamboanga, Bacolod, Rosales, Pangasinan and General Santos City and all Regional Offices nationwide. The elementary level exam will start 6:30 in the morning until 2:00 in the afternoon while the secondary level is until 6:30 PM. Below are the detailed programs courtesy of PRC. Other important reminders from Board of Professional Teachers such as requirements to bring during exams, attire/ dress code, allowed and not allowed on examination day, general instructions to examinees as well as the complete coverage of exams both for elementary and secondary levels of March 2018 LET are itemized at below program courtesy of the Professional Regulation Commission (PRC). An examinee will pass the examination if he/she obtained not less than 75% rating and has no rating of 50% in any of the of the tests. Room assignments for March 2018 LET will be available at PRC website as well as this website few weeks before the scheduled examination while the results as well as list of passers for elementary and secondary are targeted to be released few weeks after the date of exams. The exact date will be posted here later. The release date will be coming from the PRC Resolution entitled “Schedule of Licensure Examination for Year 2018”. During the LET exams conducted September 2017, 21,198 elementary teachers out of 80,509 examinees (26.33%) and 49,626 secondary teachers out of 107,020 examinees (46.37%) successfully passed the exams . PRCboard.com is among the trusted websites when it comes to providing timely and reliable information on any government-related examinations. Updates can be retrieved right at this website or at our social media pages via Facebook and Twitter.